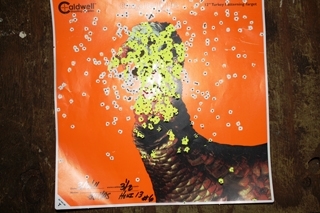 When getting ready for the spring turkey hunt, patterning your shotgun should be the first thing on your mind. Patterning is a commonly overlooked part of spring preparation. However, it should be the most important thing on your to do list. Remember, hunting without patterning your gun, is like heading into the whitetail woods without sighting in your rifle. A great place to start is online. Hunting articles, forums, and gear reviews will give you an idea of some shell and choke combinations that work well for others with your same firearm. If your gun comes equipped with a factory tube, or you already have a tube, consult the manufacturers website. Manufacturers of firearms and chokes have started to post recommendations for shell and shot size for their tubes. After finding some recommendations, you will need to purchase a variety of shells in the recommended shot sizes. Splitting the cost of shells with a friend or group of friends will help cut down on the out of pocket expense of patterning your gun. When setting out to pattern your turkey gun, it’s best to start close. Most shotguns do not shoot straight out of the box, and with increasingly tighter chokes and better loads, it is more important than ever to have your gun dead on. Grab a couple low brass pheasant loads; the low brass shells will save your shoulder from the recoil of magnum loads. Start off at ten yards. Your pattern will be very tight, causing a single hole in your target. This will make it easier to see exactly where your gun shoots and make it easier to adjust your point of impact to match your point of aim. After-market sights and specialty turkey hunting scopes can help with adjusting guns that don’t shoot perfectly straight. If you are using the traditional shotgun bead, make sure to do all your shooting wearing your turkey gear. A slight difference in how you shoulder your shotgun can change your aim point when using traditional bead sights. good supply of targets. You will need at least one target for each manufacturer, shot size, and distance. yards, and then forty to forty five yards and repeat the process again at each distance. Start off by laying each of the targets out on a large surface where you can examine each target and easily compare them. A few of your targets will obviously not make the grade and will not require further examination. Remove those targets and cross that shell off your list of possibilities. Next, start checking your patterns for voids. A turkeys head is about the size of your fist, and a void in your pattern that big could cause missed opportunities in the field. The targets that are left will require a pellet count. Draw a ten inch circle around the bull’s-eye on your target and count every pellet in the circle, the more pellets the better. After completing your pellet count and excluding voids you should have your load chosen for your spring hunt. When patterning your shotgun and making the final decision on your choke and shell combination, remember the reason for pattering is to make your shotgun shoot consistent. So chose the shell and choke combination that gives you the most consistent and repeatable pattern at all ranges. 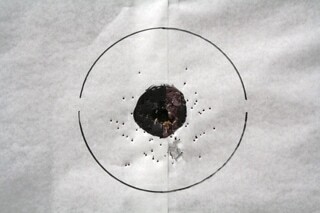 The time taken to pattern your gun will make sure that you’re ready when the opportunity in the field presents itself.